Before entering your inventory items, you need to set up the control records. These include the Inventory Store, Locations, and Classes/Categories. From the Master Menu select Inventory Control > Set-up Control File. If you do not have Inventory Control on your Master Menu, try Food and Beverage/Retail then Inventory Control > Set-up Control File. You need to set up the Inventory Store, Locations, and Classes/Categories. 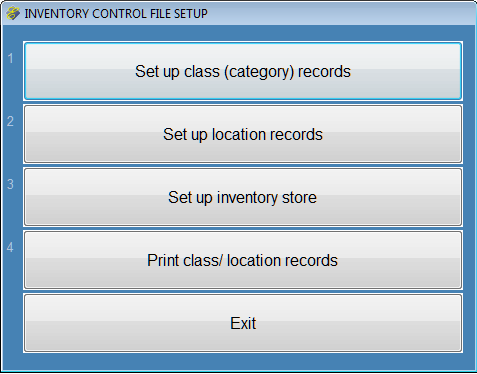 The Inventory Store Record contains parameters as explained below. "Print PLU on P.O's? )Y/N):" Answer Y if want the Price Look-up Code to print on purchase orders for items containing a PLU. May also be used for SKU and other identifying numbers. "Item 'delete' password:" Enter a password up to 8 characters if you wish to require users to enter a password in order to delete an inventory item. You man leave this field blank if you do not wish to require a password for item deletes. "Restrict transaction location? (Y/N):" Enter Y to restrict transaction locations to those locations designated in setup. For example, if you have a location R but that location is not designated in Item F134, then you cannot receive or transfer Item F134 into location R if you answer "Y" to "Restrict transaction location". 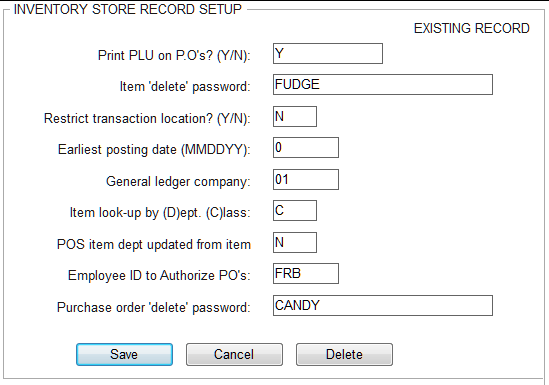 "Earliest posting date (MMDDYY):" Enter the earliest date to allow transactions, purchase orders, or physical inventory. You may leave this blank. "General ledger company:" Enter the 2-digit company where COG (Cost of Goods) transactions will post. 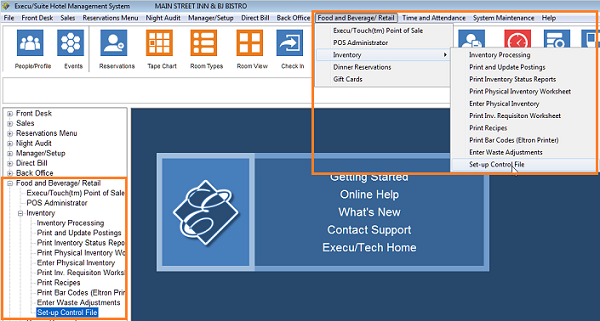 This is for properties using Execu/Tech's Back Office module. If you are not using Execu/tech's Back Office and General Ledger, you may leave this blank. "Item look-up by (D)ept. 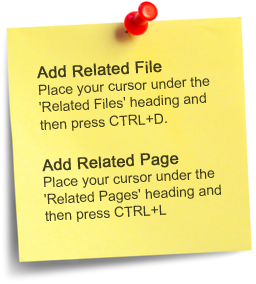 (C)lass:" Enter D to look up items by description and Department. Enter C to look up items by description and Class. "POS" item dept updated from item:" Enter Y to populate the POS item's revenue department code from the inventory department. 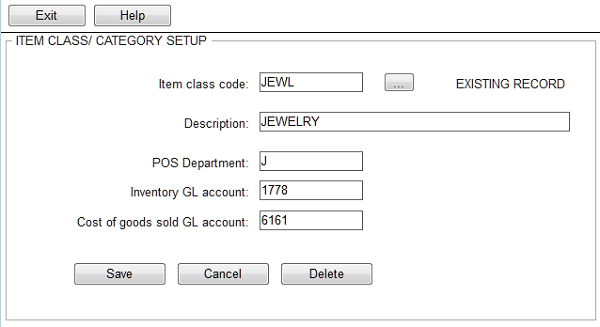 Enter N to populate the POS item's revenue department from the inventory class (default). If you leave this field, POS item's revenue department will update from the inventory item's class. "Employee ID to Authorize PO's:" Enter the employee ID of the person responsible for authorizing purchase orders if you require PO authorization. If a different employee enters the PO, an email will be sent to the Authorize PO employee who will in turn click the "Authorize" button on the PO. Most properties do not use this feature. You may leave this field blank. 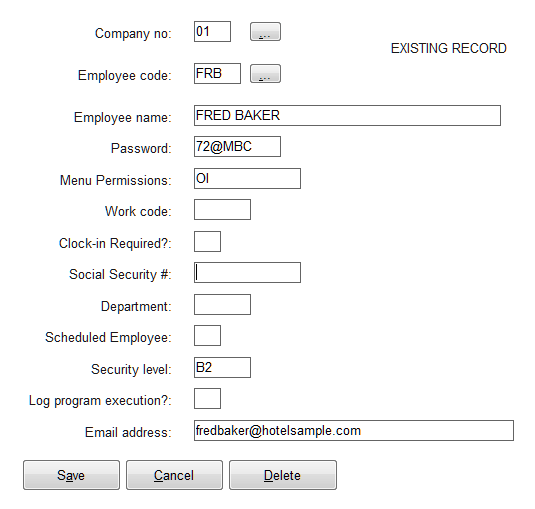 See image below for sample employee ID setup. "Purchase order 'delete' password:" Enter a password up to 8 characters if you require users to enter a password in order to delete purchase orders. This field may be left blank if you do not require a password to delete purchase orders. The Employee ID entered into the "Employee ID to Authorize PO's" field must exist in Employee Records in System Maintenance. That person must have the letter I in "menu permissions". If you wish the employee to receive the "Authorize PO" email, you must enter a valid email address for the employee. If you designate a user to receive the automatic Authorize PO email, you need the Authorize PO template, INPOAUTH.HTM. If you do not have this file, contact Execu/Tech. Every item must have at least one location. You may designate up to 13 locations for each item. You need at least a receiving location such as a warehouse, a stock location such as a freezer or storeroom, and an issue location such as a kitchen or store. The three locations may be the same. Each location should have a code, either 1 or 2 characters, and a description. Each item must have a Class (Classification) or Category. You may have broad categories such as "SNAK" for snacks, or you may have specific categories such as "CBAR" candy bars.